Quinoa is becoming extremely popular among people who are looking for healthier food options. For parents, the quest for good food for their child is endless. With so many articles and write-ups about replacing rice with quinoa, the question, “Is quinoa better than rice?” may arise in your mind. This article will help you make that choice easily. Read about the amazing benefits of quinoa in this article. The first thing you should know about quinoa is that it is not a grain like rice. So, this comparison itself is a tad bit unfair. For adults, quinoa is a simple option to manage their weight while eating a wholesome meal where the carbs from rice are cut down. However, in case of children, a good moderation of the two might be a good idea to give them a balanced meal. Rice has its own benefits for children. It is very easy for the child’s tummy to digest and it also has the necessary amount of carbs for a child who is generally more active. The growing years of a child’s life require the fuel that carbs give them in order to fuel all the developmental activities that are taking place within the body. That said, including quinoa in your child’s diet is a good idea. This is the seed of a plant called goosefoot that belongs to the same family as spinach and beets. Although it can be eaten as a grain, it is not really one. That is why it is called a pseudo-grain. This pseudo-grain has several health benefits for people of all ages. Quinoa is known to have more fibre than most grains. You get almost 10-16 grams of fibre in every 100 gms of quinoa. This helps keep your child feeling fuller for longer. It can also prevent issues such as high blood sugar and high cholesterol in the case of adults. One of the best quinoa benefits for kids is that it is rich in several minerals such as magnesium, phosphorous, copper, iron, potassium, zinc and folates that help your child in terms of development. You can also keep any deficiencies related to these micronutrients at bay. 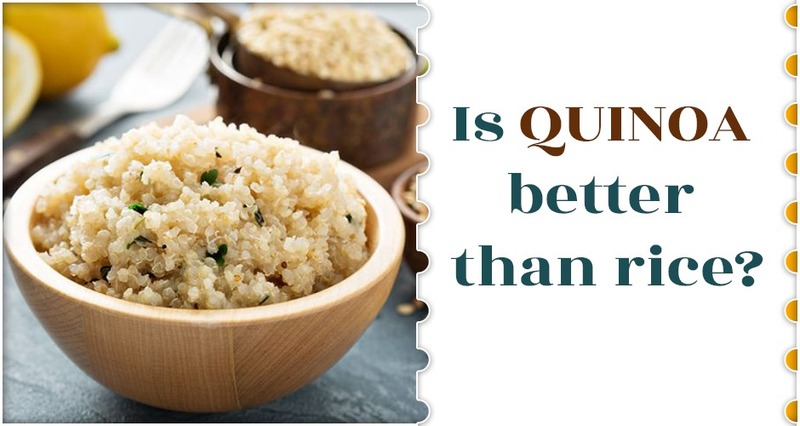 Since it is rich in fibre, the advantage of quinoa is that your food is digested a lot better. You also have the advantage of better absorption of the nutrients that you consume through your regular diet. When you are trying to figure out is quinoa better than rice, this is one place where quinoa stands out. It is one of the very few plant sources that it’s rich in proteins and amino acids. It is called a complete protein food which means that it contains all the amino acids that are needed by the human body. This is an added benefit if your child has ever displayed any signs of gluten allergies. Of course, rice is also a gluten-free food. So, you can give your child multiple options with quinoa and rice to make his or her diet a lot more interesting. There are two important plant flavonoids in quinoa called Kaempferol and Quercetin. These flavonoids are known to be anti-inflammatory in nature and can also act as a powerful anti-viral. This is a very important thing for younger children especially. The high fibre content of quinoa is known to keep blood sugar in control. It also has a low glycemic index which means that it does not allow the blood sugar level to go up suddenly when digested. Quinoa is known to be rich in antioxidants that have several benefits such as improved immunity, better skin and hair health and a lot more. If you are dealing with issues like childhood obesity or are looking for a healthier alternative for your child in general, then the low carb content of quinoa makes it a good choice. This is why it is one of the most preferred foods when it comes to weight management.